The A-1 (4 Bar) Gold Metallic Euro Flap envelopes are perfect for sending out invitations, announcements and stationery with a simple, classic look. The A-sized envelopes have side seam construction, with large, deep "V" flaps. 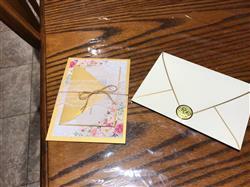 These items are often purchased together with this item: A-1 (RSVP) Gold Metallic Euro Flap Envelopes (3 5/8" x 5 1/8"). Click the right arrow (swipe on mobile) to view more items. I received the envelopes very quickly! It was wonderful! I used this paper for my Wedding invitations which look amazing!!! Invitations were too expensive online, but I still wanted them to look good and expensive. This was a great option. I paired them with the gold metallic petal card. I definitely recommend! !